We present CoLe, a model for cooperative agents for mining knowledge from heterogeneous data. CoLe allows for the cooperation of different mining agents and the combination of the mined knowledge into knowledge structures that no individual mining agent can produce alone. CoLe organizes the work in rounds so that knowledge discovered by one mining agent can help others in the next round. 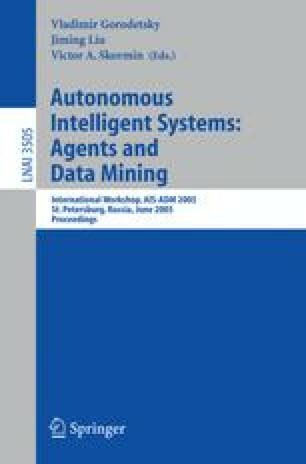 We implemented a multi-agent system based on CoLe for mining diabetes data, including an agent using a genetic algorithm for mining event sequences, an agent with improvements to the PART algorithm for our problem and a combination agent with methods to produce hybrid rules containing conjunctive and sequence conditions. In our experiments, the CoLe-based system outperformed the individual mining algorithms, with better rules and more rules of a certain quality. From the medical perspective, our system confirmed hypertension has a tight relation to diabetes, and it also suggested connections new to medical doctors.